Weak demand resulting from historically low prices has made life remarkably tough right across the supply chain. It is estimated that the collapse in oil prices, beginning in 2014, led to a global reduction in capital expenditure of some 40% over the following two years. Major projects that could no longer even come close to previously established profit criteria were deferred or dropped altogether. Now, however, the industry may well be seeing the first shoots of a recovery. Although still well below even the post-recession high point – $115 per barrel for Brent crude in 2011 – prices appear to be stabilising at a sustainable level. Combined with the drive for efficiency savings that took place in every corner of the industry following the collapse, those higher prices are showing signs of stimulating a renaissance in activity. The big issue for companies in the supply chain – businesses like UK-based specialist tubing manufacturer, Fine Tubes – is how to gear up for this anticipated recovery without overextending themselves. Matching availability to demand is critical for Fine Tubes because of the sourcing complexities involved in manufacturing high-performance tubes from specialty alloys, such as stainless steel, nickel and titanium, that are used to achieve maximum corrosion resistance and to withstand pressures of up to 60,000 psi. Of course, gearing up will only reap rewards if the product is right. Fine Tubes’ unique selling proposition (USP) is its ability to meet the most-exacting customer specifications – an ability built on 75 years of experience. Today, the company manufactures tubes required for downhole, hydraulic and chemical injection control lines; subsea umbilicals; instrumentation tubing; downhole gauge cables; and pressure housings, to name a few. Whatever the application, the key requirement is meeting the high-performance criteria required in the most hostile environments, thereby minimising the risk to the operator and reducing the ultimate cost of ownership by manufacturing to the very highest accuracy, quality and integrity. The industry’s growing optimism was evident at the recent ADIPEC exhibition in Abu Dhabi where Fine Tubes showcased its latest range of high performance products. 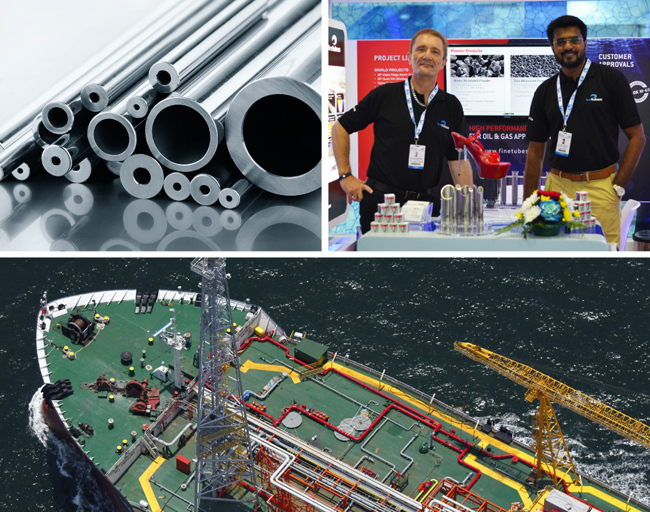 The Fine Tubes booth experienced an unexpectedly high number of visitors and generated strong interest in the company’s portfolio of precision tubes in stainless steel, titanium and nickel alloys. Numerous successful meetings indicated a cautious optimism and that the downturn is approaching its end. AMETEK SMP - the division of which Fine Tube is a part – is a global leader in the manufacture of a range of specialty metal products, ranging from precision metal tubes, high-purity strip, foil, ultra-thin foil, shaped wire, high-purity metal powders, master alloys and clad metals. All of the six companies within SMP are niche specialists with a record of serving the oil and gas industry. The breadth of what SMP offers as a one-stop solution provider of specialty metal solutions for critical applications is yet another string to the bow of Fine Tubes as the company prepares itself for the upturn.